Oh no! I'm so sorry to hear and to see that poor little guy with that huge gash on his face. I'm glad he's okay and I hope he heals quickly! Oh my goodness! I literally stopped breathing when I saw your poor sweetie's head. I'm not a parent yet, but my maternal instinct just went into overdrive. 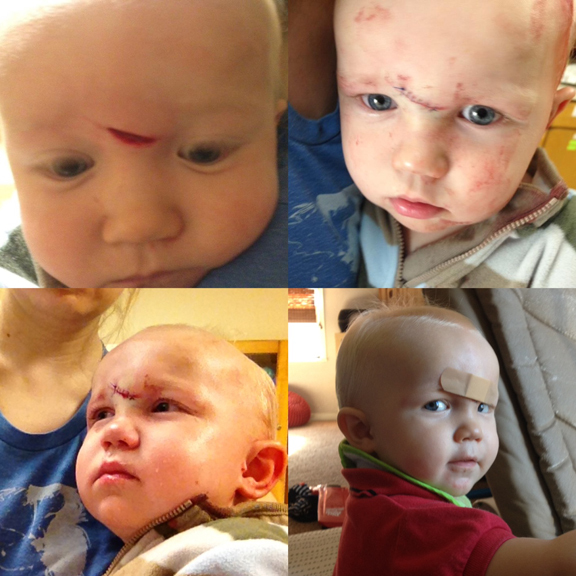 I'm so glad he's OK. And hopefully since he's so young, that scar will go away as he gets older. Good for you to make it to the hospital in one piece. I'm terrible when it comes to blood. I once had a kitchen accident and immediately passed out...I can't even imagine trying to keep it together if it was my child. Sending you good vibes. I'm terrible too! Once my husband cut his foot badly, and he had to get his own towel to apply pressure because I was completely useless. So sorry to hear that! When I was little, me and my sister were staying at a hotel with my parents and we were jumping back and forth between two beds and one little slip and my sister smacked her head on the bed frame. She was rushed to the ER and had to have stitches as well in her forehead. It really scared my parents! She is 21 now and still has a scar, although not too visible. I wouldn't worry about it too much. My parents didn't try to get rid of the scar, but I know there are natural ways to help it go away. It's always nice to hear of other people with similar experiences that turned out well. Thanks! Poor kid that is the worst. I'm sure he won't have a scar, Parker had stitches on his chin and the doctor said make sure to put sun screen on the scar every time he goes out in the sun, after 2 years it has fadded and you can't even notice. So be dilligient with that sun screen and his scar will fade. Sad thing is this probably isn't your last trip to the ER with stitches, boys will be boys. I have never heard that about sunscreen! It will be tough since we spend so much time out side, but if it will help his scar, I'll definitely be vigilant about it. Thanks, Kenna! I am going to second the sunscreen. Sun damage is one of the things that can make even a small scar permanent. I have a little scar by my eye that was not from a major cut when I was child for just that reason. Make sure he always wears a sun hat and be careful about sunscreen and you should be just fine. Oh my word, poor baby! I'm so glad he's okay! You poor thing! I would have been a nightmare!! It is so scary not be able to have your little ones in bubbles right?!? I hope you guys have a better week! My son has a scar in the same place, he fell on a rock at the campground when he was 3. He is almost 8 now and while you can see if if you're looking, most people wouldn't even notice it. This brings tears to my eyes! Not because of the scar, or even the fall really (kids are so resilient), but how scary it must have been for you!! Sending love to the whole bunch of you! It was the scariest thing I have ever experienced. We're doing ok now though! Thanks, Anna. So scary! I got woozy just looking at the pictures! I've gotten such a weak stomach as I've gotten older! A little girl got a bloody nose in a class I was subbing for the other day and luckily there was an aide there or I don't know what I would have done. Your post and the pics gave me chills, as it brought me back to my son's accident when he was 2, 3 years ago. He tripped and fell, hitting his head on a slate fireplace hearth, cutting his eyebrow open to the bone. It took 50 stitches in three layers. It was a nightmare that I kept replaying over and over in my mind, and, like you, was so upset about the thought of his perfect face having a scar. The horror of it did ultimately fade and now, at 5, his scar is there, but barely visible; he's as beautiful as ever. We were, and still are, obsessive about sunscreen, as the sun is the enemy of scars, and he always wears a hat as well. Just thought I'd share our very similar experience with you, hoping it may provide you a bit of comfort. Thank you so much! I can't even imagine. 50 STITCHES?! I think Tate had 8 or 9. He had a few internal, and 6 external. I really do keep replaying it in my mind. If only I had tried harder to reach for him when he was moving around, if only that blanket hadn't been on the ground, if only I had thought to cover the bedframe. Oh well. What's done is done. You are the second person to mention sun screen. I had never realized sun exposure was such a big deal to scars! I will definitely be really careful about that. I am so sorry Madeline! I am so glad he's ok.
As for the scar, it gets better. I have a teen who received a head wound. When he was 4yrs old, while playing in my building's playroom, he fell into the air conditioner. His forehead opened and he had to get several stitches - I think a total of 12. He is now 18 yrs old and the scar is barely noticeable. You can only see it if you know where to look. Like Anonymous said make sure to use sunscreen - and moisturizer for that matter (apply after it heals). It helps tremendously. how scary! the pictures reminded me of the time i fell and had to get 12 stitches on my face. the ER nurse told me a little secret: vitamin E, the kind you get at target in the vitamin aisle. poke a little hole in the capsule and squeeze out onto the scar once the stitches come out and the wound heals. it will work wonders. my scar is almost invisible, and as tate grows, his may eventually disappear. Awhh, we have been there before with our son. Keep your head up and I am happy to see him smiling again.